This morning an electric car in a showroom started smoking. Due to quick acting from the employees of the garage and the fire department, the car was driven outside. Because it’s an electric car, inventive acting was needed. 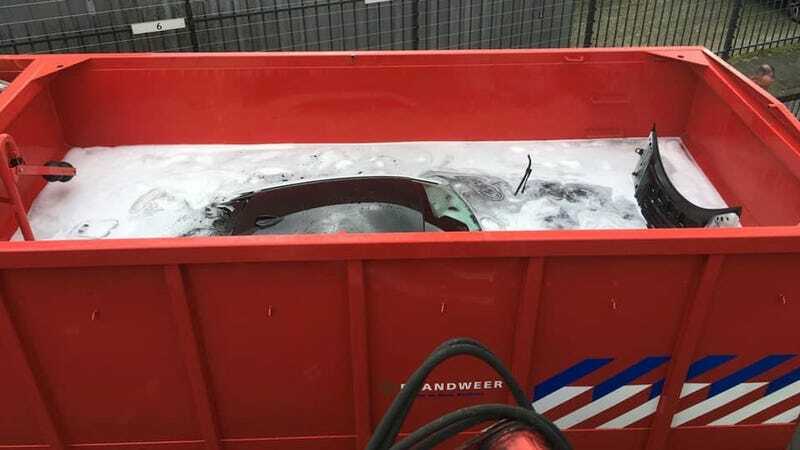 The car was immersed in a tank filled with water, because extinguishing it the ‘normal’ way can be difficult with these cars. For the next 24 hours, the car willr emain in the tank. I’ll be honest, I didn’t think it was practical to dunk a smoking car into a giant tub of water before today, but now I’m learning (as we wrote yesterday) that this solution actually makes a lot of sense. The i8, for the record, is a hybrid, with a three-cylinder, 1.5-liter engine coupled with 11.6 kWh battery powering an electric motor that all combine to make 369 horsepower, but you knew all that. Such extreme lengths are sometimes needed because it takes a lot of water to put battery fires out, or about 3,000 gallons by Tesla’s estimation, and the fires can linger for up to a day. There’s also wires that firefighters shouldn’t cut (the orange ones, because those are the high-voltage ones) and constant threat of reignition. Put all that together and, well, the giant tub of water thing looks pretty smart.